I spent much of the last decade as a restaurant critic in Chicago. When people find out what I do, they invariably ask: “So what’s your favorite restaurant in town?” For critics, narrowing down to one restaurant is a nearly impossible answer. There’s usually a half dozen in rotation—and The Purple Pig is almost always in that grouping. 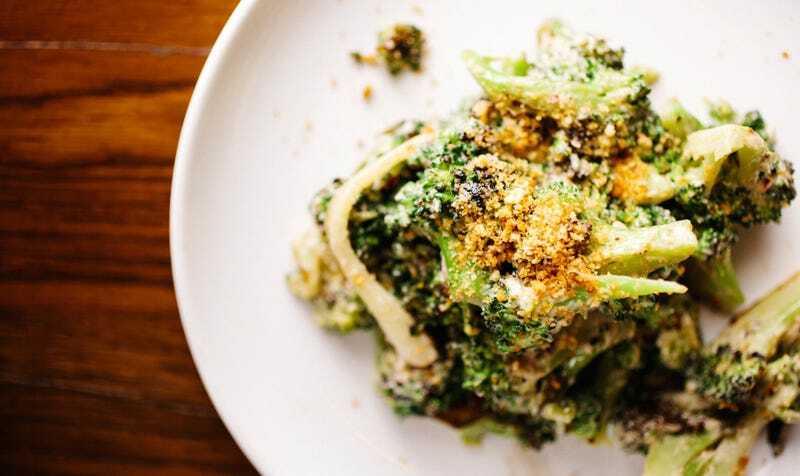 Their tagline is “cheese, swine, and wine” and I’ve yet to experience a clunker dish from chef Jimmy Bannos, Jr.
That said, for a restaurant with rendered pork fat coursing through its veins, my favorite dish at The Purple Pig is its roasted broccoli. It’s a classic preparation—broccoli blistered dark, roasted garlic, topped with toasted breadcrumbs. The secret weapon, however, is the anchovy vinaigrette. I’m willing to exercise hyperbole and call it god sauce, because a sauce this delicious can start religions and convert anchovy-cynics. What makes The Purple Pig’s anchovy vinaigrette better than standard-fare bagna cauda is its heavy reliance on confit garlic, which gives the sauce an undertow of roasty sweetness. Essentially, you add a cup of garlic cloves into a saucepan of oil, then let it cook at the lowest heat for an hour and a half until it’s soft and sweet. Add the softened garlic and garlicky oil into a food processor, whazz it up with anchovy fillets, olive oil, salt, and lemon juice, and you’ve got a nutty, magical sauce made to spoon over roasted broccoli/cauliflowers, a dip for garlic bread, a smear on grilled chicken thighs—I’ll bet it’s even good on a dirty hubcap. Dump a tin of anchovies and its oil into a food processor. Then add all the softened garlic cloves and process until smooth. Keep the paste moving in the processor, slowly drizzle in the garlic oil, about half a cup, and then a few swigs of olive oil. You’ll want to achieve a thick emulsion that resembles spackle in consistency, and this may require more (or less) oil depending on the anchovies and garlic. Once you have a very thick mixture, squeeze in lemon juice and pulse until the mixture thins to salad dressing viscosity. Taste and adjust with lemon and salt.